Need some extra room to access your low profile vehicle? With our 2 piece 56 inch Race Ramps, we made it happen by breaking the ramp in two. It's a little innovation of ours that lets you get underneath and around your low profile or low clearance vehicle safely and easily. The Campbell Hausfeld 12-Volt inflator with safety light (AF010800) features an innovative design with two inflators in one. High-flow feature allows you to quickly inflate air mattresses, rafts and other low pressure/ high-volume items. The high-pressure pump (150 maximum PSI) inflates a wide variety of Inflatable items including sports balls, bicycle, car, Truck and SUV tires. The light is perfect for night-time roadside emergencies lighting your work area while allowing other motorists to see you. The easy to use Lock air valve allows for easy inflation. Powered by a 12-Volt outlet for portability and convenience, keep this handy inflator in your trunk or glove compartment for peace of mind. Includes sport needle and raft/air Mattress adapter nozzle. Finish your projects faster and easier with Campbell Hausfeld - the air power expert. The Campbell Hausfeld digital powerhouse 12-Volt inflator (AF011400) takes the worry out of any roadside emergency. Simply program the desired PSI level (100 maximum PSI) for your Tire, tractor, Motorcycle, ATV, car, Truck, suv or RV, connect the leak-proof threaded air hose valve and turn this little powerhouse on! the LED light provides the proper lighting for nighttime inflation. The cooling fan kicks on as needed to prevent overheating and allows for 30 minutes of continuous use. Once the desired pressure level is reached, the motor automatically shuts off. Just disconnect and go! the AF011400 also includes a sports needle and inflation nozzle allowing for recreational inflation usage. Finish your projects faster and easier with Campbell Hausfeld. Erickson Manufacturing's TRI-FOLD Aluminum Ramp features an Anti-Skid surface. With the arched design it makes loading low clearance equipment easy. The 9" x 72" ramp folds twice for easy storage. Lightweight and compact with a carry handle makes lifting easy. Sold as a pair with a 1000 lb. rating per pair. Ramp is secured by included safety straps. Erickson Manufacturing's TRI-FOLD Steel Ramp features an Anti-Skid surface. The arched design makes loading low clearance equipment easy. The 9" x 72" ramp folds twice for easy storage. Sold as a pair with a 1000 lb. rating per pair. Each Ramp is secured by an attached safety chain. 56 inch (Pair) Need some extra room to access your low profile vehicle? With our 2 piece 56 inch Race Ramps, we made it happen by breaking the ramp in two. It's a little innovation of ours that lets you get underneath and around your low profile or low clearance vehicle safely and easily. 56 inch (Pair) is rated 5.0 out of 5 by 1. 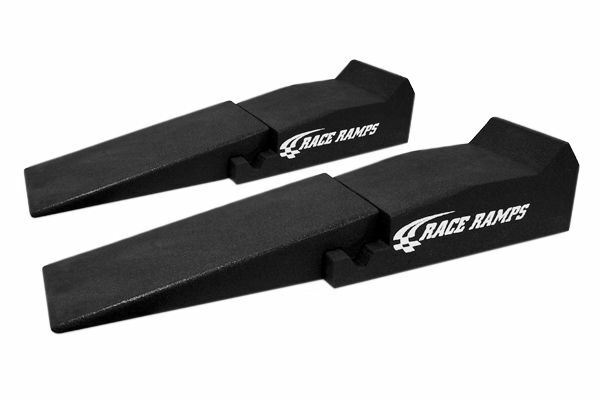 Rated 5 out of 5 by Scooter12 from Very Nice I bought these Race Ramps for my 1988 Chevy Camaro 5.7 Iroc and they worked outstanding.Perfect height and width with room left over on the sides.A little expensive but I always wanted these and I’m glad I purchased them. The weight capacity is 1,500 lbs. per ramp (per wheel) which equals a 6,000 lbs. Vehicle weight capacity.